Two Bears Farm and the Three Cubs: Can I Work This? Ok, I was all set to blog about something completely different today. But I couldn't. Because I'm so distracted by the fact that I'm wearing a WHITE skirt. And I'm not a skirt person. I might wear a skirt as part of a suit to a job interview. I might, on occassion, wear a skirt to work. But I don't ever wear skirts just hanging out around the house. I just don't do it. I also don't do running skirts. No sir, No way, NOT GONNA DO IT. Here's the thing, though. I bought this Danskin workout skirt at a thrift store for $3. An impulse buy if you will. I didn't even try it on - one of those things you can tell will fit just by looking at it. The saving grace of this skirt is that it has a black racing stripe down the side, which relegates it as sporty. Therefore, I can possibly deal with sporty - not girly. So I've had it a while now and put it on for the first time this morning. It has those stretchy biker shorts underneath and an elastic waist, plus zippered pockets (which I love). I put it on, actually, in desperation because the one pair of shorts that fits my flabby postpartum twin waist are dirty. And it's going to be hot today. And once I got it on I was all OH. OH, this skirt is SO comfy. But it's WHITE. And a skirt! And I'm a little bit TomBoy. Whatever shall I do? I have no issues wearing it around the house (particularly since it's even more comfy than my standard issue yoga pants, if that's possible) but if I wear it out, will people mistakenly think I am all feminine and stuff? Nothing better than a housewife who shops all day and eats bon bons (um, no offense if this is your life - but somehow I suspect my fellow moms don't categorize themselves so)? The horrors! I paired it with a sort of well worn ribbed black tank top. Definitely NOT girly. Today we'll be headed to story hour at the library and this evening I have a meeting of the multiples club. And so I ask. Can I do this? And should I? 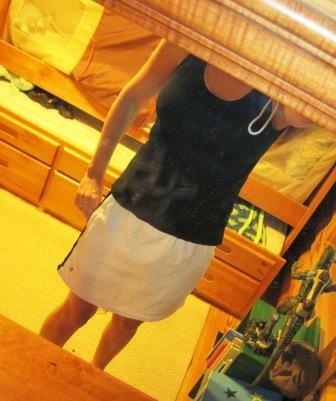 Or should this skirt head straight to the donation center, where some more skirty-girl than I can sport it? Should I choose physical comfort over mental comfort? Sorry the picture is grainy. It was taken in Pierce's room, where the furniture has been passed down from my dad's side of the family. Therefore the mirror is antique and a little grainy. Wear it! You don't look girly, you look sporty! You look like all the tough MTN biker girls I see at DH's races! You look great! I second the shoes. They make all the difference. Put on your fave sneaks and all will be well with the world. girl. you's hot. also. i'm wearing a white skirt on my blog today. we're like twins. I think it looks great too and so sporty and comfortable I would wear it. Joking aside, I know a lot of triathletes who love the skirt and feel that it helps them be more modest while having a great range of motion.